Pretty up your lingerie drawer with camisoles and chemises to cherish. Flirty satin babydolls and chemises with ruffles and lace edging are boudoir ready. For day, give your underpinnings a luxe edge with sheer slips in sugar-sweet pastels, delicate strappy camisoles and seamless shapewear. 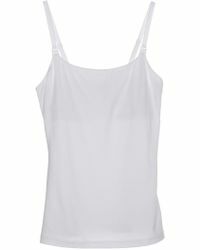 Choose from Mimi Holliday, La Perla, Stella McCartney, Spanx, Yummie Tummie and more.